Talk starts at 7.30 at Ludlow Assembly Rooms. Everybody is most welcome to come along (non members £5.) See you there! The Cheltenham Graffiti Festival was something brand new, a push organised and run by artist Andy 'Dice' Davies with the aim of getting quality street art into Cheltenham, and he managed to do a phenomenal job. I signed up a few months ago, as I'd really wanted to get back into stencil work and paint jams but hadn't been able to for a couple of years. I was a bit nervous, but I did my usual preparations of colour sketches, test sprays to make sure the stencils lined up correctly, and making sure I had enough paint (I always overdo it with cans, but it'd be quite embarassing to not be able to finish a design due to running out... and you can never be quite sure how absorbent a new surface might be). My piece was of the ancient Egyptian god Anubis - at school, in year 3, the class had a term-long project on the ancient Egyptians, and the mythology and art stuck in my head. This seemed a good time to do something with it, with a character that I found particularly striking. The three of us headed for cover, the best we could find being a bit of overhanging foliage, and waited it out. When the downpour ended, it was time to carry on. I was pretty impressed with the Kobra paint I was using - it dries almost instantly, even in a somewhat moist atmosphere; my previously-used Montana Gold paint had never fared so well in the damp air. I was able to start the final layers (pic3), but then the heavens opened again, this time so badly I feared that my stencils (cut on 300lb paper) might get ruined - I had tried to cover them in plastic, but it was an impromptu and imperfect solution. Passing joggers and walkers huddled with us under the sparse shelter, as they didn't even want to brave the short journey back home. It drizzled on and off for the rest of the day, so I had to just keep on running out and doing what I could (part of it done with a sheet of taped-together bags I draped over the surface and myself so I could carry on in a light shower). It got done, though! And in case you're wondering, that's Captain Viridian from the game VVVVVV, hanging upside down. He's there purely to stop the main Anubis piece from being such a po-faced picture. Our summer exhibition has drawn to a close after ten busy days in St. Laurence's church. The preview evening was well attended when the mayor, Tim Gill, formally opened the exhibition. It was pleasing to see more diversity than usual in the types of exhibit, with textile art, stone carving, illustration and abstract painting all represented. There was even a painting that incorporated recycled parts from a computer (and it sold, too - congratulations to Jacquie Langham). It was also lovely to see work by several new members. Our tribute to Marcel Duchamp helped gain publicity in the local press, and this was reflected in the large number of visitors that came to the exhibition. Perhaps the uncertain economic times led to fewer sales than we might have hoped for, but nonetheless we sold over £2,200 of exhibits and we managed to break even financially, despite having hired additional lighting for the exhibition. Many people deserve a big thankyou for their hard work in making the exhibition happen, not least the exhibition team of Lesley Connolly, Ruth Tune, Anne Fox, Pat Innes, Val Turner. Also Val Alexander for help with hanging (no small job), Samuel Bebb for painting the large poster board, Dave Tedham for taking away and storing all the bits and pieces, Helen Jarvis for counting the "favourite exhibit" slips, plus all those who stewarded and all those who provided the artworks which of course are the whole point of the exhibition. We are grateful to our sponsors for the prizes awarded as follows. 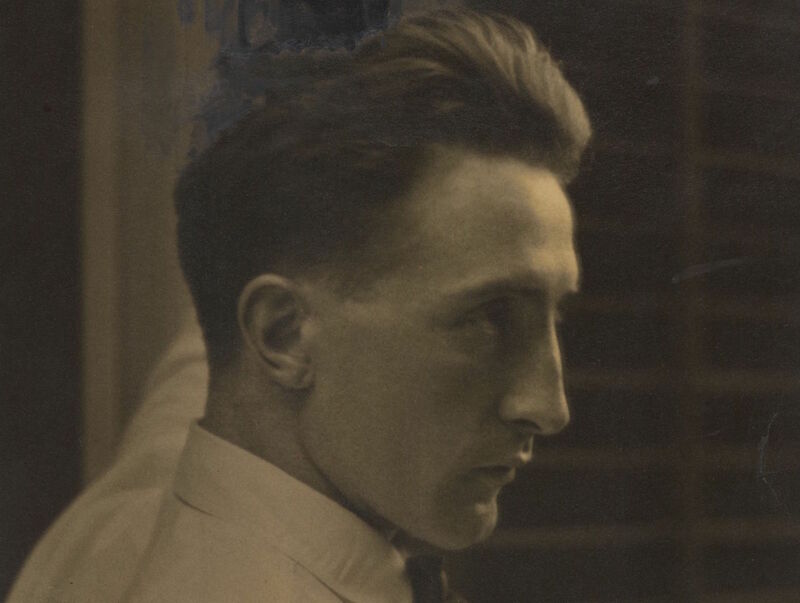 ...the legends of Marcel Duchamp. A urinal as a work of art was not Duchamp’s idea. In March 1917 in New York, George Biddle, a painter, hired a model to pose for him. The model arrived wearing a scarlet raincoat, and a hat decorated with carrots, beetroots and other vegetables. When George asked her to disrobe it was revealed that her clothing beneath the raincoat was a series of curtain rings up one arm (stolen from a store), a birdcage round her neck, with a live canary, and a bra made of two tomato tins held together with string. 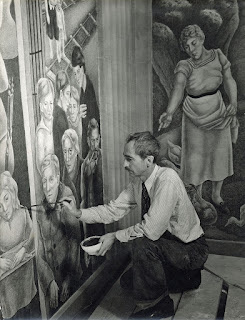 While George painted, it appeared that it was the model who was the more creative artist. 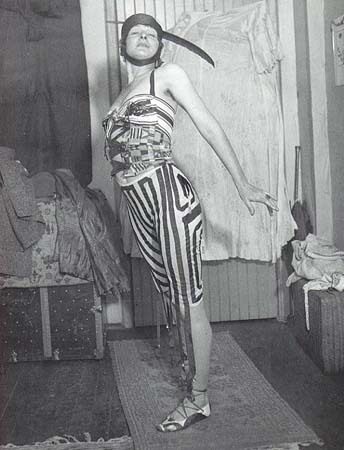 Baroness Elsa von Freytag-Loringhoven. Duchamp met Elsa (or Elsa met Duchamp), and the pair were mutually impressed. In a letter from Duchamp to his sister in April 1917 he wrote that one of his female friends had started calling herself ‘Richard Mutt’, and that this ‘Richard Mutt’ had sent him a porcelain urinal as a sculpture. Elsa's pseudonym “R.Mutt” is a pun, in the context of the war. “Armut” is German for poverty, and embodies Elsa’s views on how the war inflicted poverty, and that the arts were intellectually poor. Elsa had been declaring street-found objects to be art long before she met Marcel Duchamp. We can wonder, now, whether Duchamp “made’ or “created” the urinal sculpture. 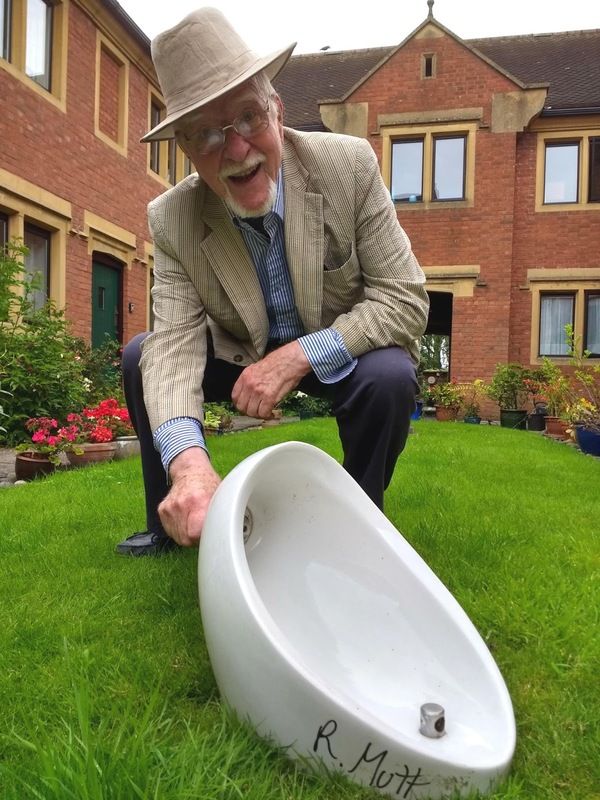 This enduring pundit discussion is typically spun around the fact that Duchamp did not physically create the urinal, and that the magic of the work - the genius of creativity - is the that he had the idea to call it art and exhibit it. He did not craft the physical object with his own hands: the urinal had been made by people who worked each day in a ceramics firm. Duchamp’s "build" was to turn it on its back and paint “R. Mutt 1917” on the side. The intellectual aspect is what has been heralded throughout the 20th and early 21st centuries: the idea, above the talent of craftsmanship. The concept, above the act of making. However he did not have the idea either. 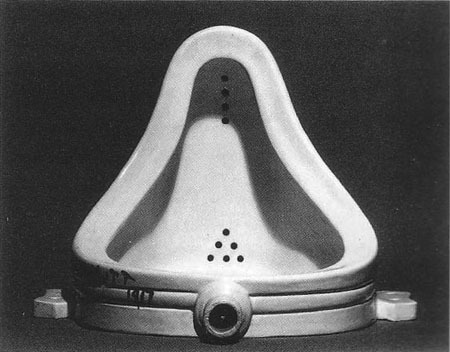 Duchamp named the piece 'Fountain' and put it in a major art exhibition. He made the concept become real. Duchamp had the idea to place that intellectual leap into a public arena: to push it at the art world and its viewers. And he had the drive and focus to achieve it. Such action is a real contribution, so often taken for granted and underappreciated. 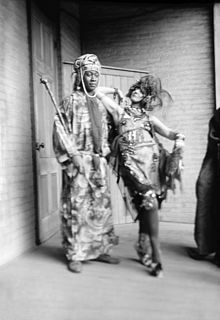 Baroness Elsa von Freytag-Loringhoven was even more impressive than her name. 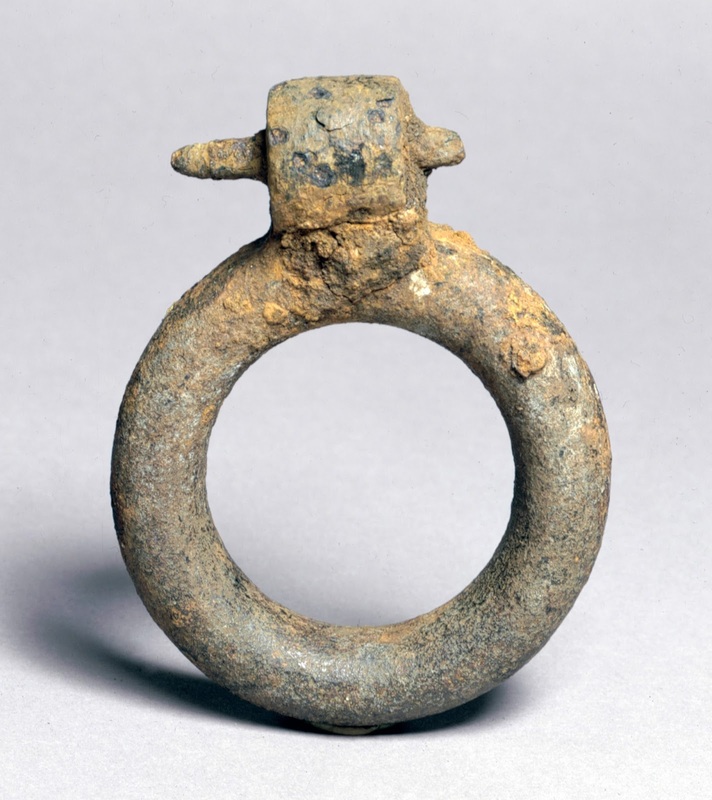 However there is little to suggest that Elsa was the only person conceiving of the notion of the “ready-made” or found object as a work of art. Elsa should be given the credit for the concept. Duchamp boldly did it. 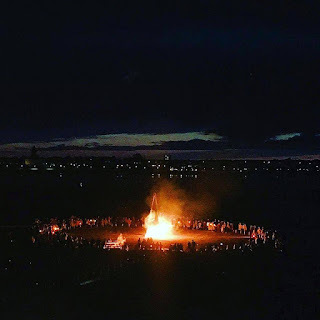 Last week I spent 4 days at a happening-style event in Liverpool, in which the artists Jimmy Cauty and Bill Drummond (aka the music band “KLF”, “Justified Ancients of Mu Mu”, and “The K Foundation”) broke their self-imposed 23-year silence about having burnt £1 million pounds in huge bundles of fifty pound notes. One thing that I learnt more strongly from the events of those 4 days is the power of making things happen. Doing them, with glee, rather than just thinking about them smugly, and letting them rest in the imagination, to evaporate like clouds. There is much power in making things happen. The economy, your pension, your childrens’ university fees, climate change…. will not be solved by ideas. We need action too. We need both. Duchamp’s contribution is “he actually did it”. This might have sounded weak twenty years ago, compared with the matter of “who had the idea?” We always need people to explore the edges and have the revolutionary ideas, of joy and solutions, and to share those ideas. Thanks, Baroness Elsa von Freytag-Loringhoven. More than ever we also need those ideas to materialise. We need people to dare ideas into life. Thanks Marcel Duchamp, you guy from a farming village. And thanks to everyone who put the effort into making the LAS Summer Exhibition happen. Happy September, everyone. The letter from Marcel Duchamp to his sister does not say that “Richard Mutt” sent the object to Duchamp. The letter says that one of his friends (feminine), under the masculine pesudonym, Richard Mutt, had sent it as a sculpture, the implication being, if Mutt was Elsa, that it was Elsa who submitted the piece to be exhibited. Of considerable further interest is that Dr Thompson located a surviving example of what seems very probably the same model of urinal as the original 'Fountain', a vitreous earthenware flat back Bedfordshire lipped urinal, manufactured by the Trenton Potteries Co., as can be seen in the article by Dr Thompson, ‘The Richard Mutt Affair Meets the Louisiana Purchase Exposition’, in St Louis magazine. ‘ELSA IN PHILADELPHIA’, an exhibition curated by Dr Thompson, is on until Sunday 24th September 2017, at the Sumerhall Long Corridor, SUMMERHALL, 1 SUMMERHALL, EDINBURGH, EH9 1PL. 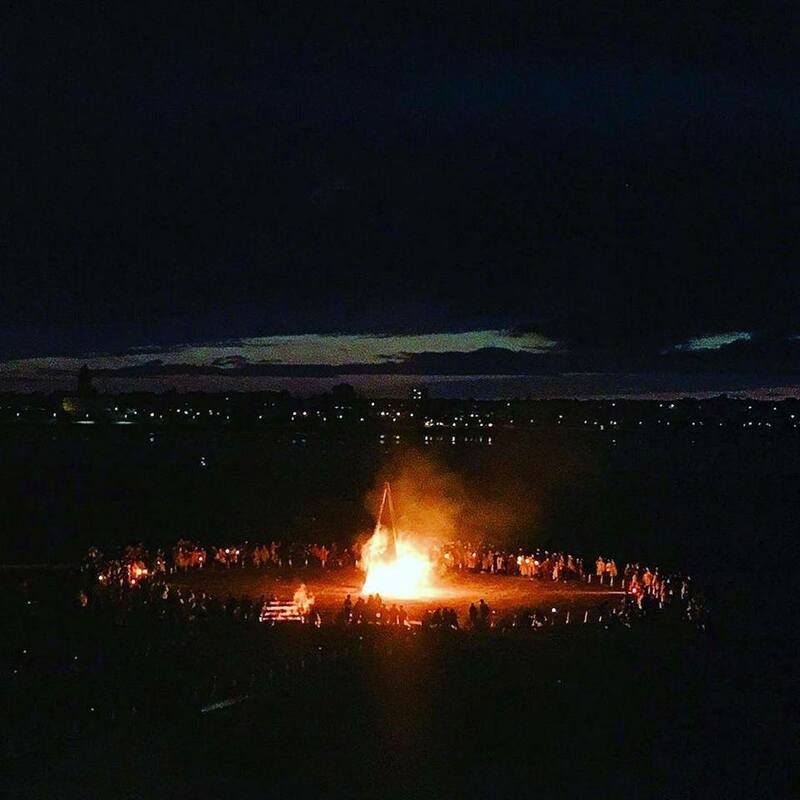 See https://www.summerhall.co.uk/about/location/ for details. Following this helpful correction from Dr Thompson, based upon that letter from Duchamp, the urinal was only sent to Duchamp in the sense that Duchamp was a Director on the exhibition’s Board of Directors of the Society of Independent Artists (the Society convening the exhibition, and to which pieces were submitted), the Board being the panel which decided which submissions to the exhibition would be exhibited. If the urinal was not sent by, or at the behest of, Duchamp then it was perhaps not Duchamp who had the idea to place that intellectual leap into a public arena: the leap of treating a single, almost unaltered bought object as an art exhibit. Or it was not Duchamp who did the deed. However Duchamp was clearly already treating single, almost unaltered bought objects as art pieces, as was Elsa. 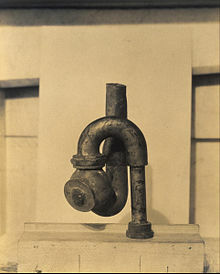 The naming of the piece as “Fountain” was possibly also done by Elsa rather than Duchamp. It is now more apparent that treating them as two separate, and possibly even competitive, acts and endeavours, about which a judgement of "was it Elsa or was it Marcel" is appropriate, seems to miss the nature of artists. The two clearly spent time together, and surely discussed such matters, as we do today when talking about art ideas with friends, whether or not we are in a formal artistic collaboration. It seems highly likely that they would have been mutually aware of the notion of progressing the concept of the "readymade" by pushing it into the art circuit, just as artists do today. The anti-war aspect ("R. Mutt" alluding to "Armut") is a sentiment which was strongly shared by both of them. Treating the matter of attribution as being wholly separate and competitive probably says more about our perspective than it does about theirs. The urinal was sent to the exhibition from the address of a Louise Norton in New York, a friend of Duchamp, who may also have been known to Elsa. Duchamp resigned from the Board after the urinal was rejected (it was rejected by vote by the majority of the Board of Directors on which he sat). Duchamp asked Stieglitz if he would photograph the rejected submission for the frontispiece of the art journal ‘The Blind Man’ of which Duchamp was one of the co-founders. The urinal was then exhibited by Stieglitz in his gallery called ‘291’. Thanks again to Dr Thompson for contacting LAS, and for bringing the letter detail, and the urinal example in St Louis, to light.